There's no "I" in Team or Canopy | Grunau Company, Inc. There is no “I” in Team. That was certainly the case for The RiverCenter entrance project at Schlitz Park. Having previously solved problems for green initiatives on the Schlitz Park grounds, Grunau Metals came together with a dream team of local experts to translate an artist’s rendering for a glass and metal canopy into a reality. The original design was over budget. With input from the building owner, local architects, engineers, suppliers and manufacturers, the design was value engineered to lower costs. General contractor Titan Building Company, architects Eppstein Uhen and consulting structural engineers Pierce Engineers, Inc. devised a structural solution for the large sheets of specialty glass the design called for. 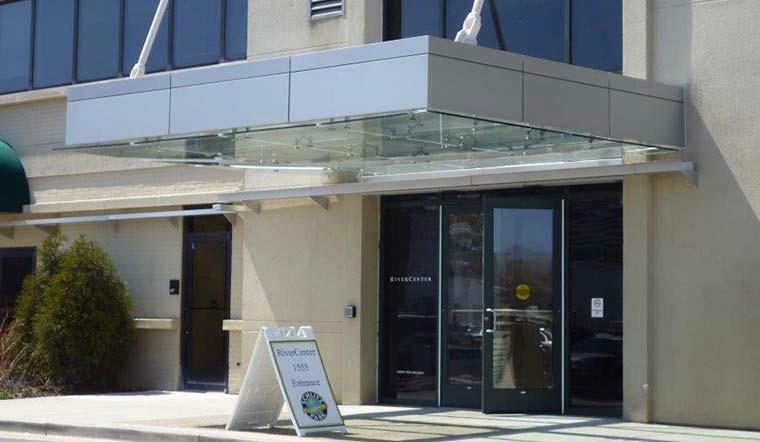 The canopy itself was a steel frame that Grunau Metals fabricated in our shop in one piece. The frame supports eight 450 lb. laminated safety glass panels. The panels hang from specially designed spider brackets that were provided by The Wagner Companies. Specialty glass like this in not something you usually find in stock. However with the help of Milwaukee Plate Glass and Old Castle Glass, the materials were sourced without a problem. In order to minimize disruption to patrons of the RiverCenter building, the team went the extra mile and erected the canopy over a weekend. The final touch to this artistic entrance was a façade covered with 3 coats of high-end paint from Sherwin-Williams. When all was said and done, the RiverCenter entrance had a new artistic and structural design element.